We often talk about the benefits of a steel building as it relates to a business or a storage warehouse, but did you know a pre-engineered metal building can be a great home as well? Modern home buyers want to get the most value for their money and it’s understandable since we’ve slowly been climbing out of a recession. A pre-engineered steel building can give modern home buyers more bang for their buck – and so much more. Steel is used in several applications, ranging from agricultural buildings to residential structures. A pre-engineered metal building is capable of incorporating everything you’re accustomed to seeing in a wood home like windows, electricity and traditional doors. Plus, remember this rule of thumb about metal buildings: they are typically half the cost of traditional construction methods, and can be erected in half the time. A pre-engineered metal building isn’t just a primitive shed or storage facility anymore, thanks to a big advance in construction technology. A pre-engineered metal building is capable of non-traditional designs since, unlike wood, you aren’t required to use load bearing walls inside the home. Loads are transferred from the roof, down the walls and to the engineered foundation. The result is an open floor plan, generally referred to as ‘clear span.’ This usually isn’t possible in wood buildings, without the aid of truss and cord systems or internal columns. Will you need an architect? Any home builder will tell you it’s important to settle on a design before you decide to build. Your first thought might be to call an architect for a design or drawings, but many steel building home builders only need the talent of an in-house engineer at a steel building supplier. Architects are usually only needed for designs like multi-level office building or structures with complex interior designs. Plus, architects are rarely concerned about cost and even simple designs can be expensive. Generally, if an architect is needed, have them design around the metal building design rather than have the steel building supplier design around architectural plans. Some architects aren’t familiar with the engineering or design criteria of specific steel building suppliers. Once you’ve designed your dream home, you want to make sure it’s going to remain structurally sound for decades. Pre-engineered steel buildings are extremely durable and strong, and come with specific coatings to protect the building for decades. The proper insulation in your steel home can help you regulate the temperature without raising your energy costs. Be sure to investigate proper insulation, not just a vapor barrier. Vapor barriers are great for a workshop or garage, but this is your home! Take special note not to use insulation with a vapor barrier if there is an existing vapor barrier already in place. If you do, there is a chance moisture can be trapped in between vapor barriers and damage your insulation. Temperature regulation can protect your home from moisture, which in turn could also prevent rust. The threat of rust is further reduced when you incorporate pre-galvanized secondary framing. To further lower your energy costs (other than investing in a ‘green’ product) pre-engineered metal buildings can utilize solar energy to power your home and can incorporate skylights into your design to take advantage of natural light. It’s possible you could save money on your taxes and raise your property value with a pre-engineered steel building, because your purchase fits the definition of a capital improvement. A capital improvement is a structure added to your property which lasts at least a year and is evident if you decide to sell in the future. If you install green energy, you could investigate the Residential Energy Efficient Property Credit and the savings associated with it. Make sure you talk to a financial professional to see if you are eligible for any of these credits or savings. Plus, metal buildings are generally classified as permanent structures – which tend to appreciate over time. Nonpermanent structures, such as pole barns, don’t usually require a foundation and don’t cause property values to increase. If you love your property and don’t want to move, but plan on growing your family, a pre-engineered metal building can be expanded easily. Expanding the length of your building requires a clear spanning moment-resistant frame. If your original building was fabricated with post and beam construction, you will need to install a clear spanning moment-resistant frame to continue your expansion. Once you have this installed, you are free to add to your building as you wish. Naturally, you are able to design your building with the intention of future expansion and you can add the proper framing to make it easier and more affordable to expand when the time comes. Adding width to your pre-engineered metal building is also a possibility. This type of expansion could require a lean-to. A lean-to is a smaller building that shares a wall with a larger building and a roof that leans against that wall. 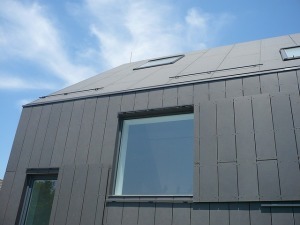 You must be sure that your roof line will accommodate your new expansion by meeting the necessary height. Be sure to take into consideration your climate because a snow load should be still accounted for when expanding in this manner. Of course, you want your home to have curb appeal! Did you know your metal building doesn’t have to look like a metal building? Sure, you might envision a boxy warehouse or a commercial building, but the aesthetic possibilities of metal buildings are virtually endless, and you can customize your structure to look exactly the way you want it to look. Take the time to research different finishing materials, and how it will impact the structural integrity, engineering and overall cost of your steel building project. You’ll be able to design your metal building and plan ahead with the help of a project manager like me. Many people have chosen to create their own steel building home. 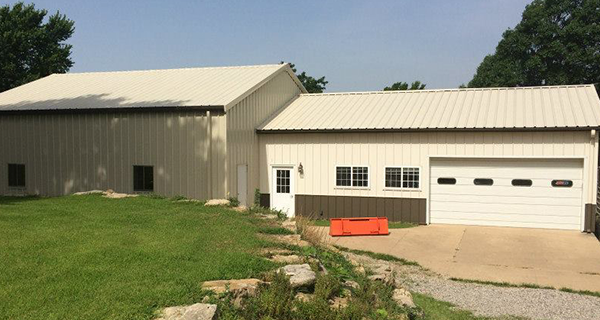 Take a look at how others have taken advantage of residential steel buildings, and feel free to share photos of your steel building home in the comments below!